This special offer is valid for new bookings occurring between February 1-22, 2016. 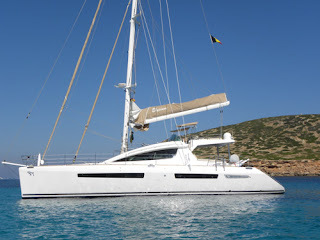 Elysium is a 62-foot Privilege catamaran with a crew of two, David and Thryn. This air conditioned catamaran accommodates 6 guests in 3 King cabins, each with ensuite head (electric toilet and separate shower stall). Guest cabins also have a hair dryer, DirectTV, DVD player, and iPod dock. There is also a single "nanny cabin" in the port forepeak. David is a Dive Master and Elysium includes 5 dives/week for certified divers, with gear included. 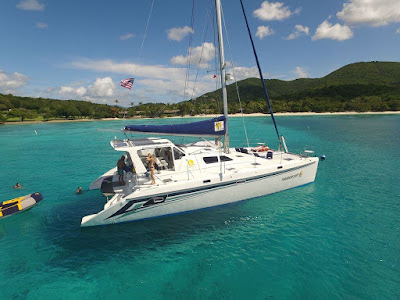 Other amenities include: 15-foot dinghy with 70HP motor, waterskis, a slalom ski, tube, kneeboard, wakeboard, 2-person kayak, 2 standup paddleboards (SUPs), 6-person island sofa, floating mats, snorkel equipment, fishing gear, beach games, board games, TV in salon, hammock, onboard wifi where available, air compressor for filling scuba tanks, dive equipment, etc. The catamaran Paradigm Shift offers you the Valentine's Day of a lifetime. 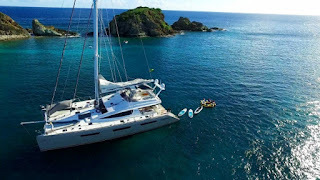 The charter yacht Paradigm Shift is a 50-foot St Francis catamaran owner-operated by a crew of two, Steven & Bonnie Carrol. 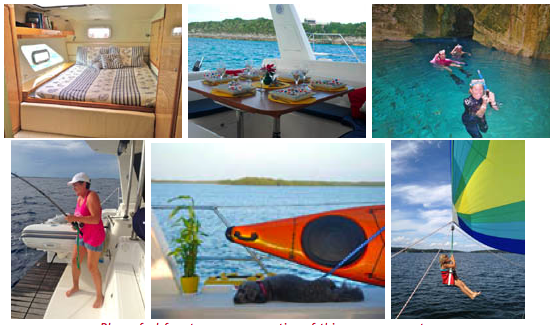 For summer charters in New England, their small dog Tabasco, a 10-pound Bichon Frieze/Toy Poodle mix will be aboard. What A Romantic Valentine ! 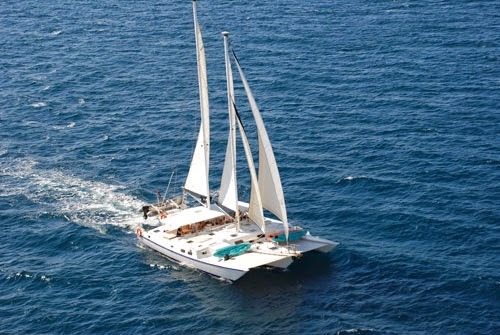 The charter yacht Promenade, a 65-foot Nigel Irens-designed trimaran, has scheduled a great 10/11-night sailing in the British Virgin Islands for February 15-25, 2016, with optional FREE sleep-aboard on February 14th (Valentine's Day). This 10-night charter is available for individual cabin bookings and is a wonderful opportunity for two people to sail aboard Promenade without having to get a large group of friends together for a private charter. PRICE: $5500/cabin, double occupancy (i.e. $2500/person). Diving: one dive/day for certified divers. Gear (BC & Reg) may be rented, if needed, for $200/diver for the length of the charter. 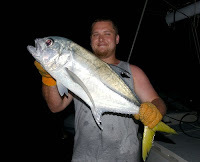 2 meals off the yacht at guest's expense (one lunch and one dinner ashore, plus you are responsible for your dinner ashore on the sleep aboard night). Promenade has a 15-foot dinghy with 50HP motor, waterskis for adults and kids, wakeboard, tubes, standup paddleboard (SUP), 2 two-person kayaks, floating chairs & loungers, 8-person floating island, snorkeling gear, fishing equipment, 40" flatscreen TV, large video library, iPod with over 5000 songs, air compressor to fill scuba tanks. Lots of toys. Internet where available. Promenade has a dive instructor and one dive/day is included. 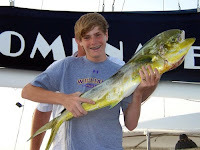 BC and regulators may be rented for $200/diver for the duration of the charter or you may bring your own. 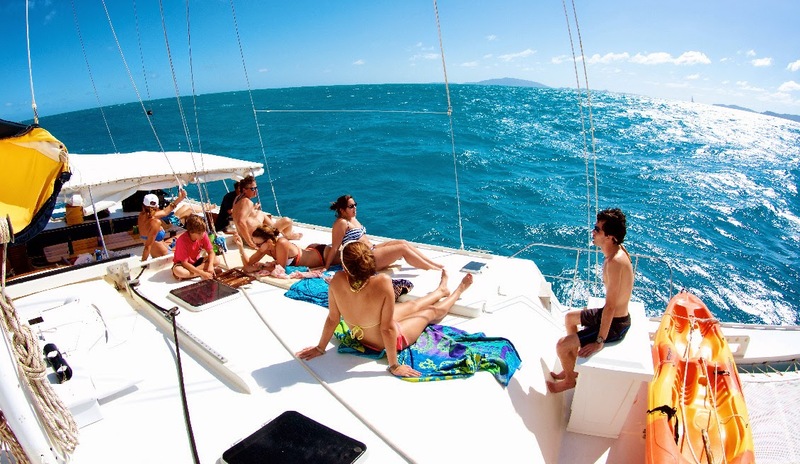 Some people enjoy chartering during a full moon to take advantage of the full moon parties in the BVIs. HAPPY NEW YEAR: All three Xenia catamarans have reduced their rates across the board on all-inclusive yacht charters. 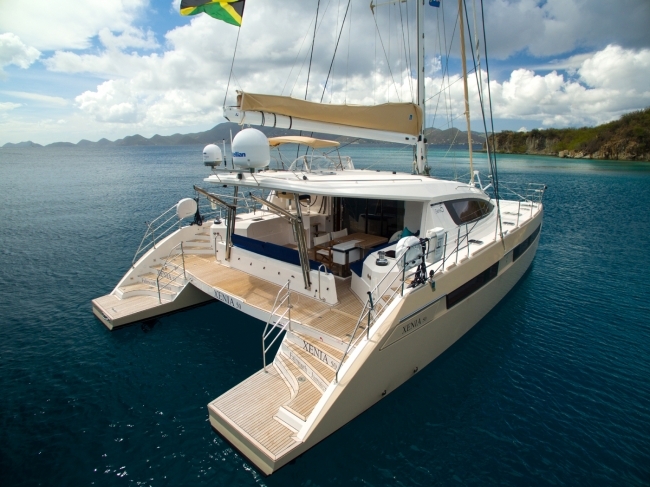 XENIA 50 was launched in 2015 and is beautifully decorated and outfitted to the highest standards. She offers three guest cabins each with a Queen berth, private ensuite head with electric fresh water flush toilets, stall shower and vanity. There is plenty of lounge space in the cockpit, salon and top deck. Nice selection of water toys. Onboard wifi. XENIA 62 accommodates up to eight guests with two king cabins and two queen cabins, each with private ensuite heads with fresh water flush electric toilets, spacious vanity and shower stalls with 2 shower heads and 6 misting heads each! Each cabin also has individually controlled air condition and has a 27" LED TV liknked to direct TV and the onboard Apple TV. The salon has a 52" 3D TV linked to directTV and apple TV server. Plenty of space for lounging and dining... Beautiful upper deck with 360 degree view, cockpit, forward trampoline area, and the main salon. 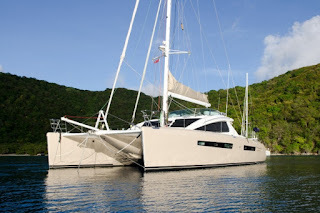 XENIA 74 combines both luxury and comfort for a wonderful sailing adventure. Accommodating up to 8 guests in 4 contemporary and well appointed lavishly furnished cabins with 3 equivalent Queen cabins and a spacious master King cabin that is the entire forward section of the yacht. All guest cabins have ensuite heads featuring Hydro massaging showers. 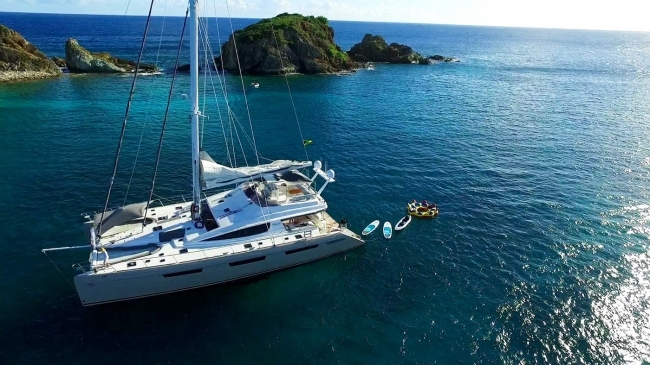 There is an abundance of space on this 74-foot charter catamaran: large flybridge, foredeck & trampoline, cockpit, and large, comfortable salon. 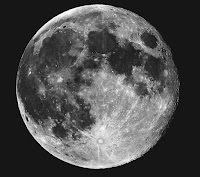 We hope you will take advantage of Xenia's reduced rates. It is nice to see a price drop.